This project has three layers of feathers, a strip that holds the turkey body away from the feathers and a stand attached to the back to make the turkey stand on it’s own. There is a picture with and without gold glitter. Of course I prefer the glittered one!! You’ll find the directions for this project, “Standing Turkey,” in the Thanksgiving Projects Gallery tab in the sidebar. 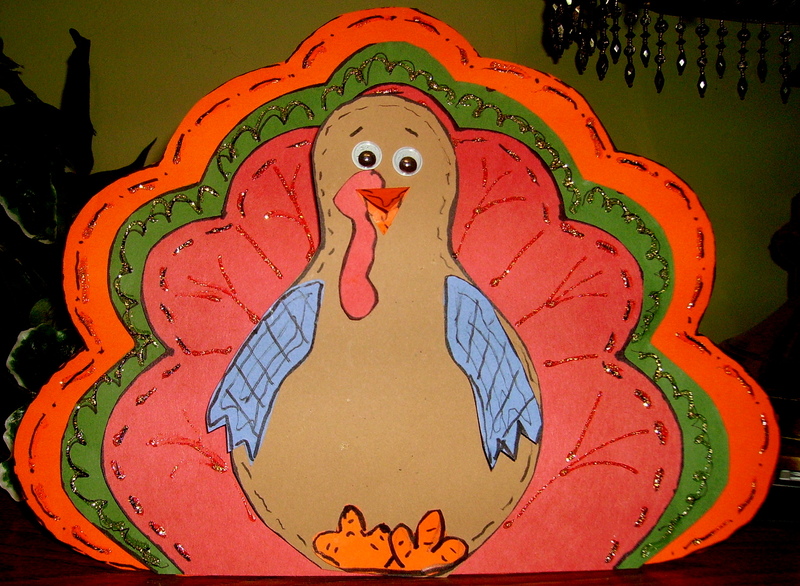 This entry was posted in Thanksgiving and tagged childrens thanksgiving crafts, craft, craft for kids, feathers, layered feathers, paper craft, stand alone, standing turkey, Thanksgiving, thanksgiving classroom project, turkey, turkey project. Bookmark the permalink.